Nixon is a modern, clean and professionally designed Joomla Template. It has 5+ website layouts. 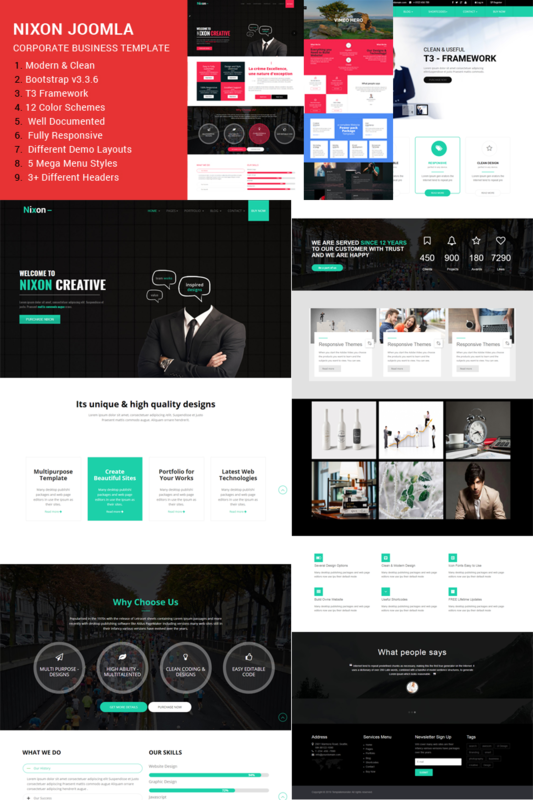 This template fits any kind of portfolio, personal website, business, corporate, design studio etc. This Joomla Template has many accent color schemes and fully responsive. The design is based on the T3 Framework and Bootstrap grid. This means it fits any device (desktop, tablets, and smartphones). It is created using the latest techniques: Bootstrap 3, Awesome Google Font, LESS, CSS3, HTML5 that makes it more powerful and flexible. Nixon is a perfect solution for corporate websites. Nixon Delivered with highly customizable T3 Framework, which gives the subject high flexibility as if you can easily change your skin or define your own style, font, etc. Note: The images you see on the screens are used for demo purposes only, not included in the download package, the original replaces the placeholders.